Physical bullying: The use of physical force, or the threat of its use. Verbal bullying: The use of language to undermine, insult or degrade another. Positional bullying: The use of the power of authority or rank, to unfairly disadvantage a subordinate. 1. How to manage the physical bullying. The physical bully uses, or threatens to use, physical force on another. This is not mere bullying, it is an offence against statue law, contrary to the Public Order Act, 1986. Quote: "A person is guilty of an offence of affray if he uses or threatens unlawful violence towards another and his conduct is such as would cause a person of reasonable firmness present at the scene to fear for his personal safety". To manage a crime is easy since no employee has the right to commit crimes. You should use the fact that physical bullying is not only poor practice, and is against company policy, it also constitutes an offence. This is sufficient for you insist that the bully desist, or you may source a legal remedy. 2. How to handle verbal bullying. Verbal bullying is the use of language to undermine, insult or degrade another. This type of bullying is psychological, social or emotional in its effects. Verbal bullying divides into two sub-types. 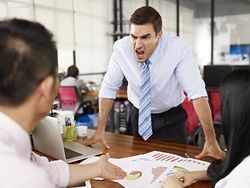 Implicit verbal bullying:This takes the form of sarcastic comments or "jokes" at the other persons expense, that is also likely to disturb the other psychologically, socially or emotionally. 1. Wait: Wait until the bully engages in the behaviour. When he/ she does, take careful written notes of EXACTLY what is said. If possible, record the language used word for word, to whom, when and how the words affected the "victim". 2. Then wait again: Do nothing with this first set circumstances, instead wait until the bully does it again. Again, you should take careful written notes of EXACTLY what the bully said, to whom, when and how the words used by the bully effected the "victim". 3. Then wait again. Wait until the bully does it for the third time. Make the same notes as listed above. 4. Then, spring into action. You now have three distinct, well documented examples, that supply you with sufficient evidence to summon the bully into a meeting. 5. Welcome the "accused bully" and be professional and polite. Never be rude to anyone. 6. Lay out your evidence, detailing the three instances you have recorded. 7. Tell the person that these instances are categorised as "verbal bullying". 8. Ask the person to respond to the allegations, and record their response, in writing, word for word. 9. Tell the person to desist; and if you think it prudent, lay-out before the bully the consequences that will follow if he/she does it again. 10. Gain the person's agreement that they should desist and record that in writing, too. 11. If the person fails to agree or if the person denies the evidence you have presented, then write the fact of their denial in your notes too. Again, record their exact words, if possible. 12. Have the person sign your notes to affirm that they represent a correct written record of your meeting. This is the most difficult for you to handle since positional bullying is often a matter of subjective opinion, not objective fact. Which means, if a person of higher-rank makes a decision, or delegates a task to a subordinate, and that task negatively affects the subordinate, then the subordinate may perceive that act as "bullying", whereas, the higher-ranking person would perceive the same act as simply a "tough decision, but one that was fully justified". Who is right in such a situation, is a matter of opinion and context of the individual case. For example: Imagine a sergeant telling a corporal, "Take three men and attack that machine-gun emplacement on the top of the hill." The corporal thinks, "Attack that gun emplacement? That is extremely dangerous. My sergeant is bullying me!" If you are in receipt of a complaint of alleged, positional bullying, and you feel that the weight of evidence is such that you judge the senior person IS bullying, then take the same twelve steps listed above. If you feel that the weight of evidence is such that it does NOT support the charge of bullying, but rather, constitutes the rough-and-tumble of workplace life, then take the complaint seriously, and record all the evidence, but take no further action, other than recording the incidents, until such times as the weight of evidence changes your view. In addition, you may want to counsel the complainant on how the world consists of people, some of whom have the authority to make decisions that you don't like, but that does not, in itself, constitute bullying. It is simply, "a fact of life".